It was a colourful afternoon across a range of Sky Bet EFL matches on Saturday as the Rainbow Laces campaign was activated. 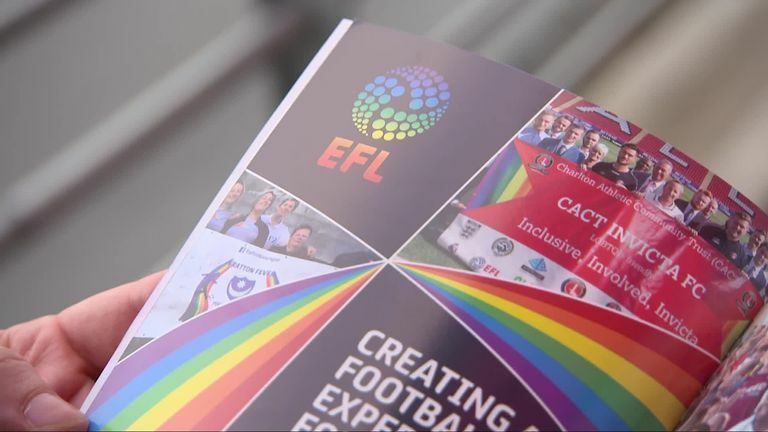 The EFL is again helping to raise awareness of the importance of inclusion by encouraging its clubs to support the initiative by the LGBT equality charity Stonewall. With at least 25 of the 72 EFL member clubs currently assisting their supporters groups of fans who are lesbian, gay, bisexual, transgender or allies to LGBT+ people, there is also a growing recognition across professional football of how Rainbow Laces is helping to widen football's appeal. This year, the EFL have invited clubs to activate the campaign at fixtures and club events during the eight-day period from Saturday until December 1. Premier League clubs will begin their involvement on Friday, with Matchdays 14 and 15 providing opportunities to join in. In the Championship, Stoke City turned their scoreboard rainbow with a special design and welcome message in the build-up to their 2-2 draw with QPR at the Britannia Stadium. Elsewhere, Leeds United's LGBT fans group Marching Out Together were handing out laces at Elland Road before the 2-0 win over Bristol City. The Whites' Supporters Trust also tweeted out a picture of players Izzy Brown and Barry Douglas holding up a rainbow flag along with Leeds United Ladies captain Bridie Hannon. Meanwhile in South Yorkshire earlier in the day, Rotherham were also activating the campaign during their 2-2 Sky Live draw against local rivals Sheffield United. Sheffield Wednesday, Preston and Wigan were among the other second-tier clubs to highlight their use of rainbow corner flags and the laces in players' boots. In League One, Wycombe showed off Adam El-Abd's rainbow captain's armband on Twitter before they beat Shrewsbury 3-2 at Adams Park. Andy Butler was on skipper duties for Doncaster, who drew 1-1 at local rivals Barnsley, and was also sporting the special armband design. There was visibility too at the home games of Bradford, Gillingham and Scunthorpe in the same division. Crawley Town recorded the biggest win of the day in League Two, thrashing Crewe 3-0 at the Broadfield Stadium, set against a backdrop of strong support for Rainbow Laces. Tranmere Rovers got in on the act before their 1-1 draw at home to Oldham with members of their 'Rover and Out' supporters group presenting Steve McNulty with his captain's armband. David Buchanan posted to social about his backing of the campaign, having led Northampton to a 2-2 draw with Grimsby. Referee Trevor Kettle and his assistants Paul Kelly and Ravel Cheosiaus were also among those involved in the game to lace up. With a busy midweek programme of games leading up to next Saturday's Championship and FA Cup second round fixtures, more EFL activations are expected in the coming days. Delia bakes Rainbow Laces cake!